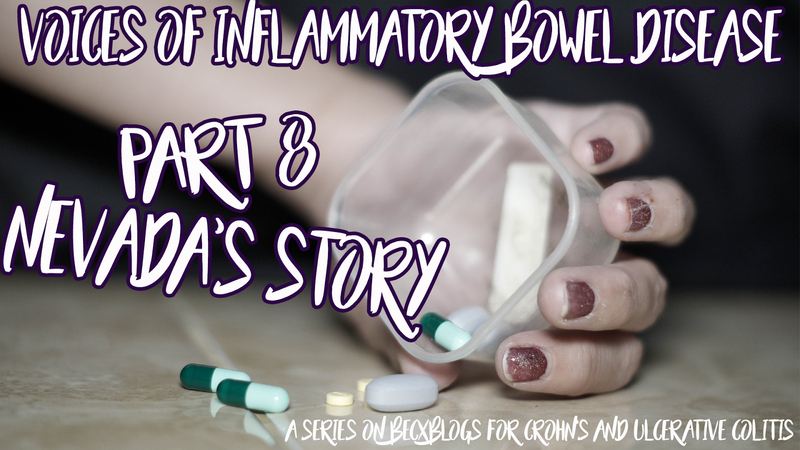 Welcome to PART 8 of the Inflammatory Bowel Disease series, where we talk to people from all walks of life with this condition; to give everyone a platform to share their story, and help to raise awareness. This week we talk to Nevada about her battle with Ulcerative Colitis. I was diagnosed with Ulcerative Colitis ten years ago. I am soon to have an MRI to reevaluate as I have had flare up's every summer. I would say my symptoms appeared gradually and looking back it was actually obvious what it was leading to, now knowing the symptoms of IBD. The first symptoms were weight loss, extreme tiredness (I would just fall asleep straight after coming home from school), not that interested in food, a patch of my hair fell out at the front, I had irritated, sore eyes, I could barely open them (which the doctors thought may have just been hayfever as it was around summer) and the final, most alerting symptom was blood in my stool. I honestly remember not feeling much about it. I didn't feel scared or worried, the doctors didn't make it seem that dramatic or serious. I have always been quite an accepting person so in all honesty I just accepted it and started medication not long after. My Colitis once diagnosed wasn't actually that serious, it was considered active but mild. I can't remember getting much, intense support but I knew the doctors or IBD nurses were always around if needed. Once I was diagnosed I was put on Asacol, which didn't work so I had my first dose of steroids at 14 which worked really well. From then on, for the next 9 years, I was up and down different doses of Asacol but last year the doctors wanted to change my medication as I started flaring more often and they thought the Asacol alone may have stopped working. I was put on Mezavant 1200mg and Azathioprine 50mg last year and together they have worked greatly! My toilet trips have dropped, I still have moments of fatigue but I generally feel better since starting them. I can only think of two occasions during hospital stays that haven't been positive or I felt I wasn't treated effectively. Every other stay has actually been really good and I have always been treated with dignity, respect and an understanding. Over the years I have also gotten to know my IBD a lot better and I know what I need when flaring, doctors and nurses have been amazing at listening and respecting that I know my body best! In a period of ten years, I have had six stays (sometimes I have stayed twice within a few months of each other) but it is always around summer. In 2014 I had two stays, 2015 one stay, 2016 two days and 2017 one stay at the end of September. This is why they are keen to do an MRI on my small bowel, just to check they aren't missing anything. They think I may have Crohns as well as Colitis due to having stays each year. I have mentioned that it is always in summer, I am really really good the rest of the year but once the end of May/June comes, it seems to get worse. They have no answer for that though. From being diagnosed, I have had two endoscopy's and three or four colonoscopies (can't remember the exact number) all of my colonoscopies have always shown mild irritation, redness and some puss when flaring but nothing ever looks as bad as I seem to feel! Stress. I feel my diet plays a small part in, there are things I purposely leave out because I know they don't make me feel good and they aren't worth it (like alcohol) but for the most part I feel it is stress that brings on a flare. Mentally I feel I almost have quite a solider way of thinking, just get on with it! I'll be fine! But then it all comes out physically and goes to my weak area, which is my IBD. I have always had anxious tendencies. Growing up I did a lot of skin picking. I picked my skin, mainly my thumb, I'd pick and bite my lips, often to the point of bleeding. I still do occasionally, I have periods of no picking at all and periods of intense picking. I've never picked at my eyelashes but I've noticed I sometimes pull them a tiny bit when I rub them. I have also had an on and off stammer. Which I think is more of a neurological thing but for me I definitely find situations that make me anxious, also make my stammer more obvious. I've always said I have a phone stammer, I find it difficult to answer a telephone without stammering when first answering but I can talk to a person face to face really well and no-one ever notices! Earlier this year I went to my doctor because I felt certain situations were making me really anxious and it was affecting my ablity to get on with things. I am also prone to low moods. More-so intertwined with when I am due on my period. I can sometimes feel like a completely different person the two weeks before my period. My doctor diagnosed me with situational anxiety and mild depression. I feel I am better at getting on top of the anxiety more than I am with low moods. My anxiety presents itself through irrational thoughts and I am aware they are irrational, I am more able to get out there and put myself in the situation that makes me feel anxious and feel fine. The low moods, although they only last for about two days, I find harder to get on top of. I was also put on the contraceptive pill which has helped with my moods. Depression/anxiety run in my family so I am predispositioned to be affected in some way. Like I said above there has always been a subtle, anxious thing about me and looking back on when I was a child I can definitely see it was present way before I was diagnosed with Colitis. When I am flaring though, my anxiety does go up. If I start going to the toilet more or the urgency kicks in then I am more worried about going out and would prefer to stay at home. From flaring every summer since 2014 I do always feel more worried when summer is approaching. I became unwell at the end of September this year but it was the opposite of what usually happens. I wasn't going to the toilet and I was in a lot of pain. 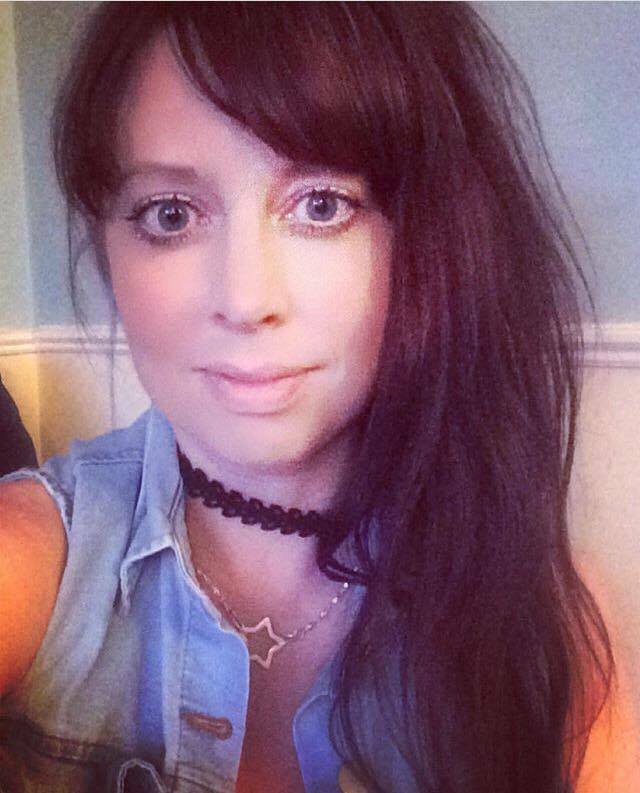 When I first went in to hospital they thought it was a stomach bug, I had started being sick when in hospital but I was discharged that weekend but nothing got better and I had never had pain like that. I'm good with pain. I don't want to cause a fuss, I am able to push through a lot of things. But this pain was not something I have had before. I had never been so emotional when feeling unwell, I literally felt like I mentally couldn't cope (which is also not like me) I was sitting on my bathroom floor in tears and I remember wishing I could rip the pain out. That is the only time to date I can say my IBD or just generally being unwell, has mentally affected me. I am trying to get my mind to stay aware that I have IBD but not to let the thoughts control me, it can be difficult! I have been on steroids five times and I do think they have had a lasting effect mentally. My doctor referred me for CBT therapy, I started on a Stress Control Course with IAPT but I was only able to attend one session, I began working and the times clashed. I am keen to begin the CBT therapy, I have it on my to-do list to call them! My doctor also did suggest antidepressants but I am not currently taking anything. I feel once I am able to start CBT therapy I will get the support needed. I can see it being beneficial. My flares don't seem to creep up on me or happen slowly. I seem to go in to a big flare straight away, within a few days.They completely wipe me out so all I am able to do is sleep, rest, try and drink water and I always end up in hospital (summer), which includes more resting and getting treatment I need. SLEEP! ha. Generally, when I am not flaring, I am super chilled anyway so I have no problem allowing myself to laze around and have a weekend doing nothing or just going to a friends house. I do want to get more hobbies though and generally meet some new people. I am thinking about (I've always been thinking about), starting yoga and dance again, I use to dance when I was younger and I still feel amazing when I dance, it feels very freeing. I feel great when moving. When I am flaring, it really is just rest and focusing on getting better, getting my energy back. I'm a rubbish communicator when flaring, all my energy goes inward on attempting to make myself OK again. I don't drink alcohol, I did have a small glass of wine a few weeks ago, for the first time in a year and a week later my glands were swelled up. For me it's not worth it. I enjoy feeling good. I enjoy feeling capable of getting on with my life. My biggest devil is sugar, cutting down or completely getting rid of it from my diet is still a challenge. Do not be embarrassed. I feel this is the main reason why many people with symptoms do not go and see someone. It's embarrassing talking about poo. Blood in stools is not something we are use to seeing. It is not something you'd want to talk about. But it is so important to see a doctor. People leave it for so long until they are in a serious way and need urgent medical attention or urgent surgery. If you can catch it early, if you see someone early enough, it can be controlled faster. IBD and the symptoms are not something that should be shrugged off. 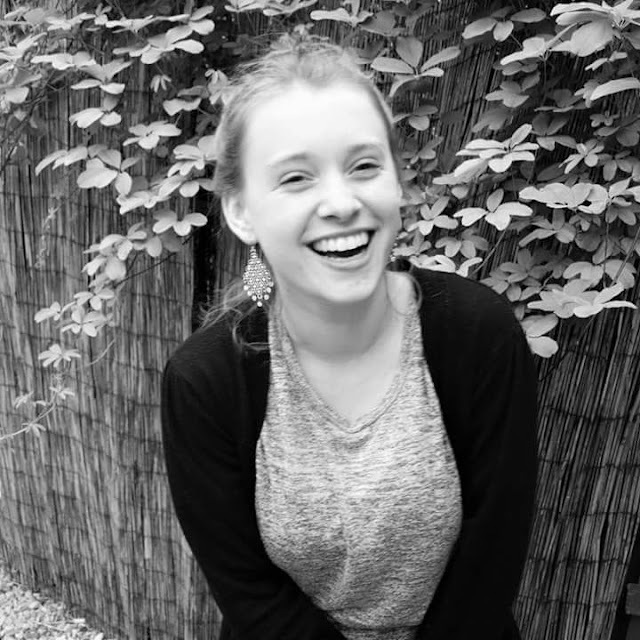 Those of us living with IBD are living with a serious chronic condition and although some of us are affected in worse ways than others, it is something that needs to be seen to and treated. No-one with IBD has asked for it. None of us would choose to live with this. If we could choose a healthy life with no medication, no hospital stays, no regular blood-tests, believe me, we REALLY would. Sometimes we can't understand why our bodies aren't working properly. Sometimes it isn't because we ate this certain thing and now we are flaring. Sometimes, our bodies decide to go in to full attack mode and we flare. By asking questions such as "well was it something you ate?" you are putting the blame on the person flaring. You are saying it is their fault their body has decided to flare. When, the reality is and can be, that those with IBD will just have periods of not being well. The best thing family members or friends can do is be present. Instead of using language that puts fault on the person with IBD, use language and words that are kind and empathetic "This isn't your fault, rest and let yourself get better". Its VERY difficult for those who do not have IBD to truly understand what it feels like. They truly will never understand but what they can do is teach themselves, educate themselves, not just on IBD in general but on the individuals experience with IBD. 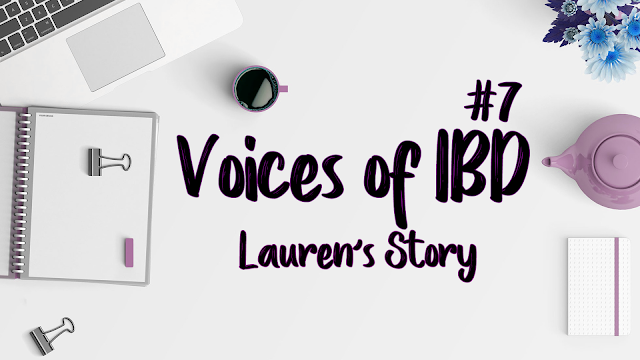 Get to know what IBD is like for that specific person. IBD is not the same for everyone. Communicate, ask them what they need, ask what is best for them when flaring, ask what is useful for them. Ask, ask ask. The friends/family members who know someone with IBD, also didn't ask for it, it is no-ones fault but it is something that needs to be accepted, those with IBD need to be heard and they need to be respected. That I am more than my IBD. I want to be more than my IBD. I want to live a life that I enjoy. I want to wake up and 80% of the time (because we don't always love our work!) and enjoy what is I'm doing. I've accepted that many things for me will not easy. I will never have an easy road. I want to help people, I want to give, I love working with children so I'd love to maybe teach one day or work with children in a therapeutic way. There's so much that I want to learn and try, there's so much I feel to do, that I simply can't let my IBD stop me. It will, temporarily, I've also accepted that, but there's more for me and there's more to me than having a chronic condition. I am aware that everything is temporary. I won't get this life again. If I'm being honest, sometimes knowing that everything is temporary has gotten me through some flares. The thought that this won't last forever, has actually felt positive to me. One day, you and me will be in the soil. I'd rather live this life I have now, with setbacks and obstacles and eventually - do the things I want to do, rather than not do anything at all. I feel I'm blessed with a positive mind. Don't get me wrong when I am in a low mood I don't feel positive. But for the most part, I can always see a positive. 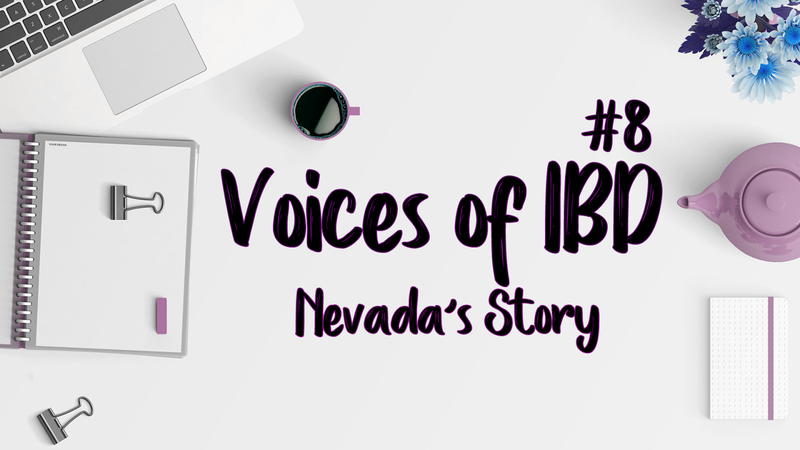 Thank you Nevada for sharing your story here on BecxBlogs. If you are affected by Crohn's or Colitis; please go to the Crohn's & Colitis UK website for further support and information. I've always been an advocate for feeding dogs the best possible diet you can afford. I used to feed both my dogs a fresh, raw meat diet but when I moved back home with my family; I wasn't able to store the food anymore. So I started searching for the next best thing. Quick note! 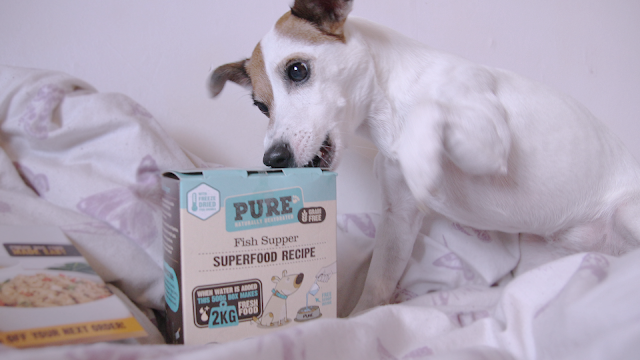 This item was gifted from the lovely people at Pure Pet Food, BUT I've have been using this food and purchasing it myself with my own money before I was sent this box to review! Pure Pet Food Naturally Dehydrated dog food is a freeze dried, grain free food with probably the best ingredients I've seen in commercially bought dog food, apart from premade raw foods. Freeze dried food is better than the usual "kibble" because it retains a lot more of the nutritional content as opposed to when it's been highly processed with preservatives and additives. When looking for a good dog food, the main ingredient should be a named meat source. Not "meat and animal derivatives", and I would personally avoid any dog food that doesn't state exactly what meat they're using in the ingredient list. 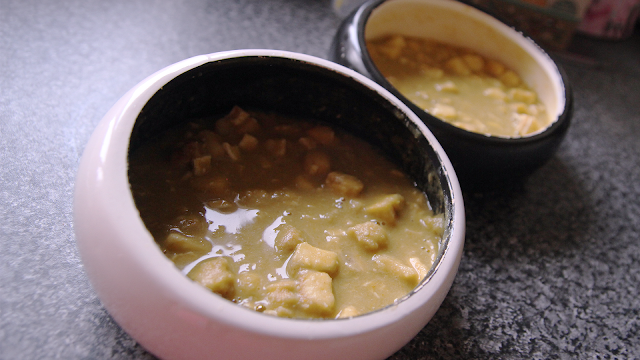 I also think a good dog food is best when it's grain free, because grains are very difficult for dogs to digest. I also 100% avoid any food with artificial colourings, e numbers, sunset yellow, tartrazine, and titanium dioxide. Dogs can be hyper enough without adding any of that rubbish into their system. 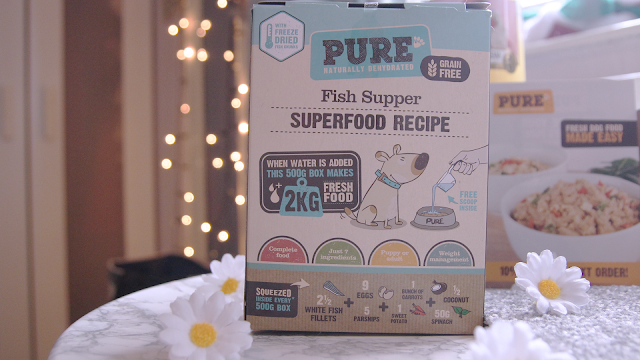 I'm so pleased that the Pure Pet Food Fish Supper recipe is clean. White Fish (25%), Parsnip, Carrot, Sweet Potato, Egg (15%), Coconut, Spinach, Minerals. It sounds like something humans would eat! Well guess what, it's also human grade food, so it's completely safe for us to eat if we wanted to. It's extremely easy to use as well. There's only a small amount of preparation! 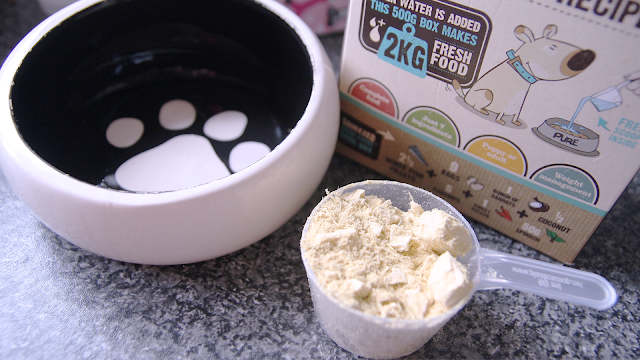 So for example, my Daisy is 5kg, and needed 1 scoop of food. I added 1 scoop of water and mixed it, after 5 minutes the food has soaked in all the water and it's ready to serve! The shelf life of the food when dry is around 12 months but once water is added it needs to be treated like fresh food, refrigerated and used within 48 hours. You can even add some of your own fresh foods into it as well, like carrots, other bits of meat and egg. But it's a complete and balanced meal so it is totally fine to feed as a stand-alone meal too. Both my dogs, Charlie and Daisy, absolutely love this food, and I will continue to feed them it. As I said before I'd always recommend feeding the best food you possibly can. 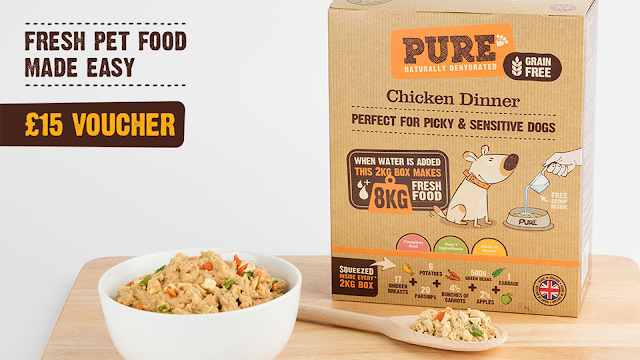 I would give this food a very solid 10/10 based on the quality of ingredients, ease of preparation, storage and how much my dogs love it! *Gifted item. All opinions are my own. 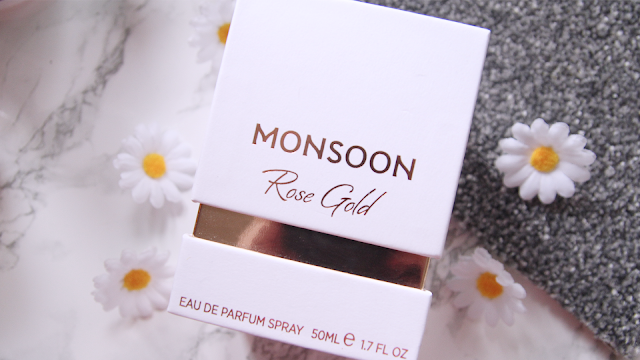 I was kindly sent this Monsoon Rose Gold Eau de Parfum, and I couldn't wait to try it out. Can we take a moment first to discuss and appreciate this stunning packaging? It comes in this stunning, simplistic yet elegant white box with metallic rose gold embossed detail. It makes for the perfect Instagram photo and I have to say and would look good on anyone's vanity table. 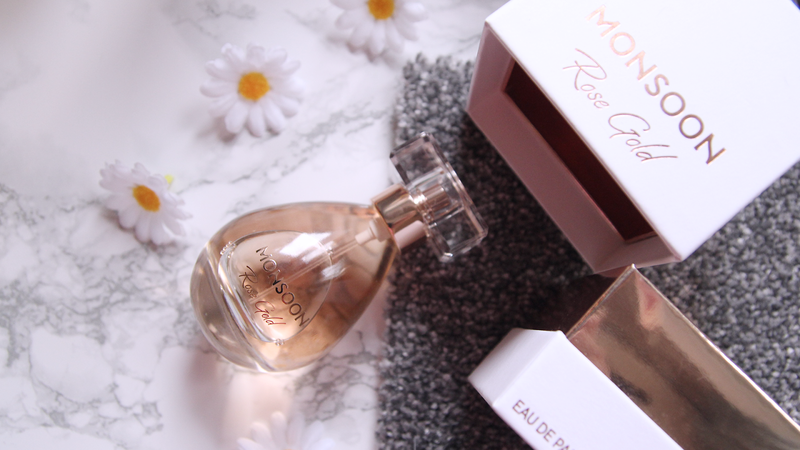 The bottle is a simple teardrop shape and the perfume colour is a pretty muted rose shade to fit in with the rose gold theme. The scent itself isn't usually what I go for. It's certainly not sweet, but it is sophisticated. It's a strong floral scent with a slightly fruity undertone. After smelling a perfume I always have to check the website to see if I got it right. The description on Monsoon is "Top notes of sparkling lemon, soft fruit and ozonic scents are layered with velvety rose, tuberose, neroli and cyclamen, and underpinned with base notes of Eastern woods, vanilla, mosses, musk and balsamic amber." It sounds extremely luxurious, right? The scent is very strong like I said, so you only need one spritz, and it was definitely long lasting. 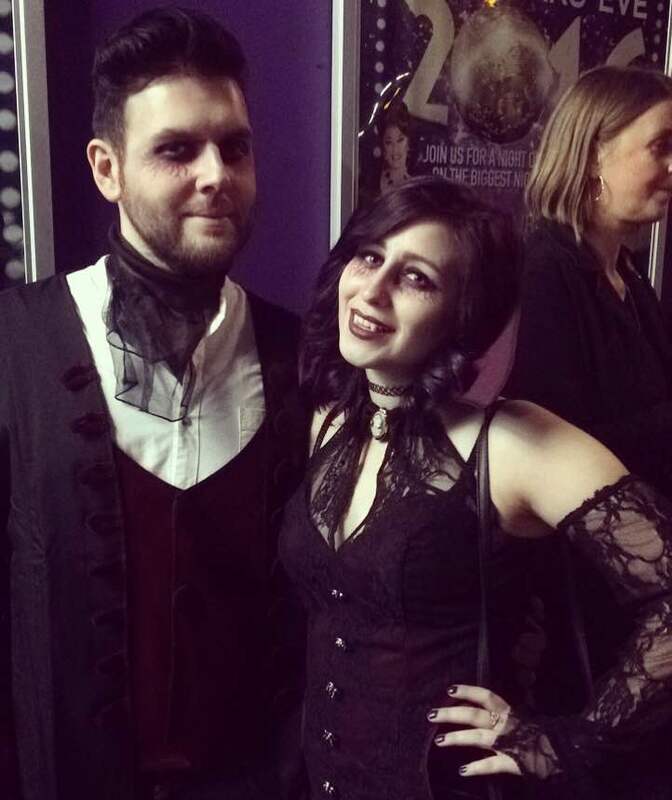 I wore it to an event recently and got compliments on it, asking what I was wearing. 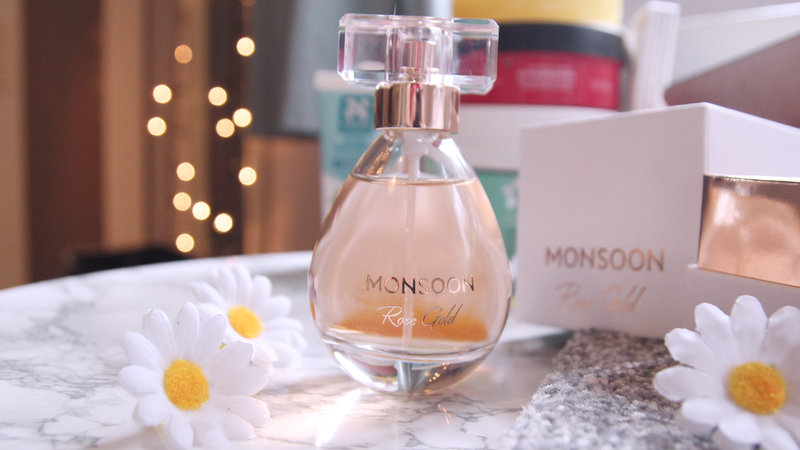 If you usually go for extremely "teen-like" scents (I'm sure you know which ones I mean) then this is perhaps not for you but if you like to smell graceful and stylish, then I would give this a try. It retails at the moment at £35.00 for a 100ml bottle, which I think for that size of perfume is a great price. It would be a brilliant gift for a friend or family member who is as obsessed with rose gold as I am. ** Gifted item. Not paid sponsorship. Get elegant nails and alluring lashes in seconds, at a fantastic price. Kiss products are a long time favourite of mine, so when I was asked if I wanted to be sent some products**, of course, I'd jump at the opportunity. I used to struggle to find lashes that I loved but now I needn't look any further with this fabulous stash. I'm a sucker for the natural look, and these Look So Natural lashes in Pretty are perfect. The band is almost invisible, so they blend seamlessly to your own lashes. They give you a lovely amount of length without being obviously fake. These are particularly good for classic events like weddings when you want to have a romantic look. Now, I've always had trouble with my nails. My natural nails are short, stubby and not that attractive. These imPress One-Step Gels are perfect for a quick fix when your nails aren't at their best, and you need them looking suave asap. I like how quick, and easy these are to use. It makes last minute plans or events where you forgot to do your nails a heck of a lot less stressful. 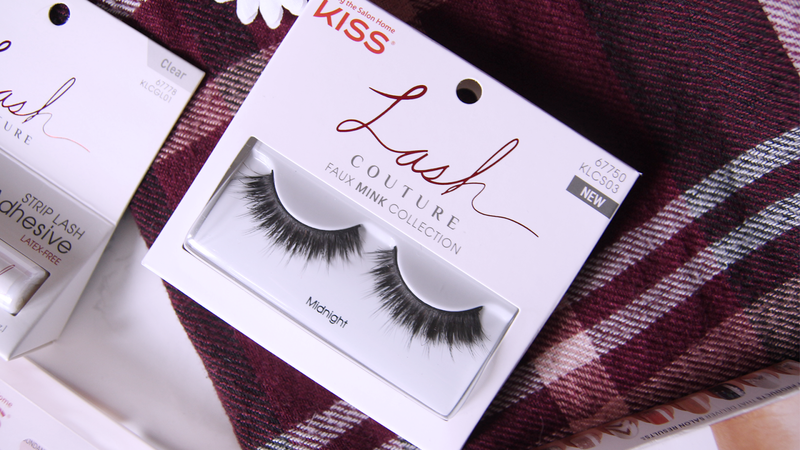 I was so excited when I saw these Lash Couture lashes in Midnight in the packages. I'm not a one for wearing heavy lashes regularly, but for me, these would be absolutely ideal for Halloween looks. They feel amazingly soft, and they were much lighter on the lid than I expected. I'm so used to thicker lashes being heavy, but these were a dream to wear. These stunning Gel Fantasy nails in peach and glitter are the perfect subtle, girly addition to a look whether you're dressing up for an event or heading out with the girls. 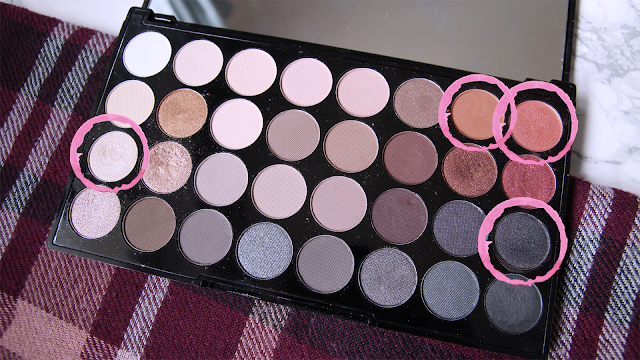 They're so easy to apply and come with a good range of sizes! I think I'll actually wear these at Christmas myself! Want the classic fluttering lashes look? How cute are these Blooming Lashes in Lily. They're beautiful, and the curl is so subtle but very effective. Again, the band is almost invisible so they blend very well into your own lashes and they feel extremely comfortable to wear. 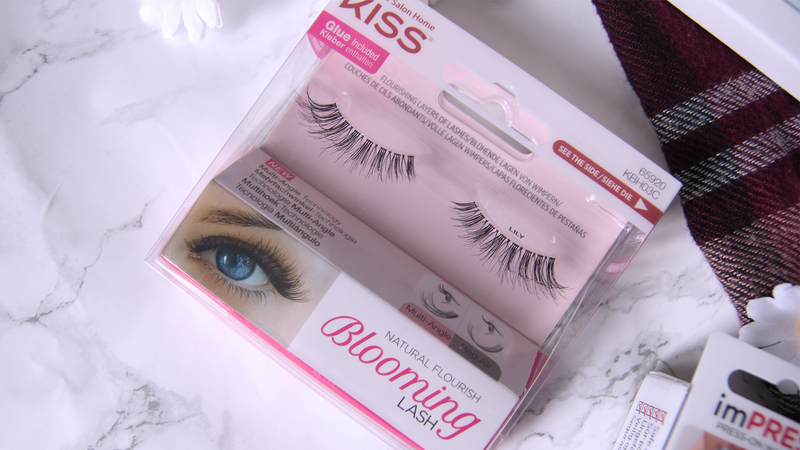 Let's not forget a staple product with all these gorgeous lashes to try out. 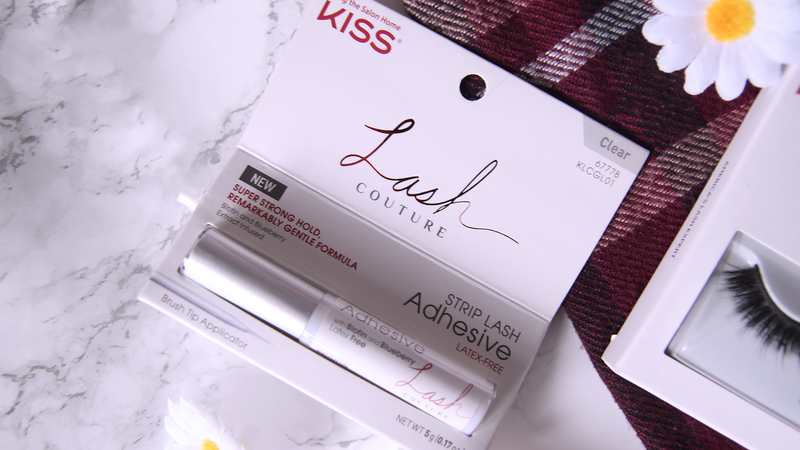 The Lash Couture Adhesive is a brilliant long lasting glue, that doesn't feel too heavy or sticky on your eyes. The brush applicator makes it very easy to apply compared to the plastic applicators that most glues come with. It also removes easily, without damaging your own natural eyelashes. 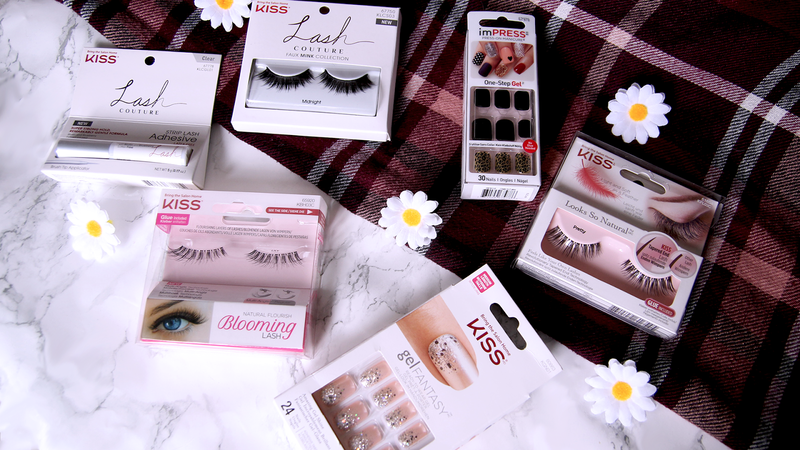 Let me know what your favourite lashes and nails are from the Kiss range, I'm always looking to try out more! 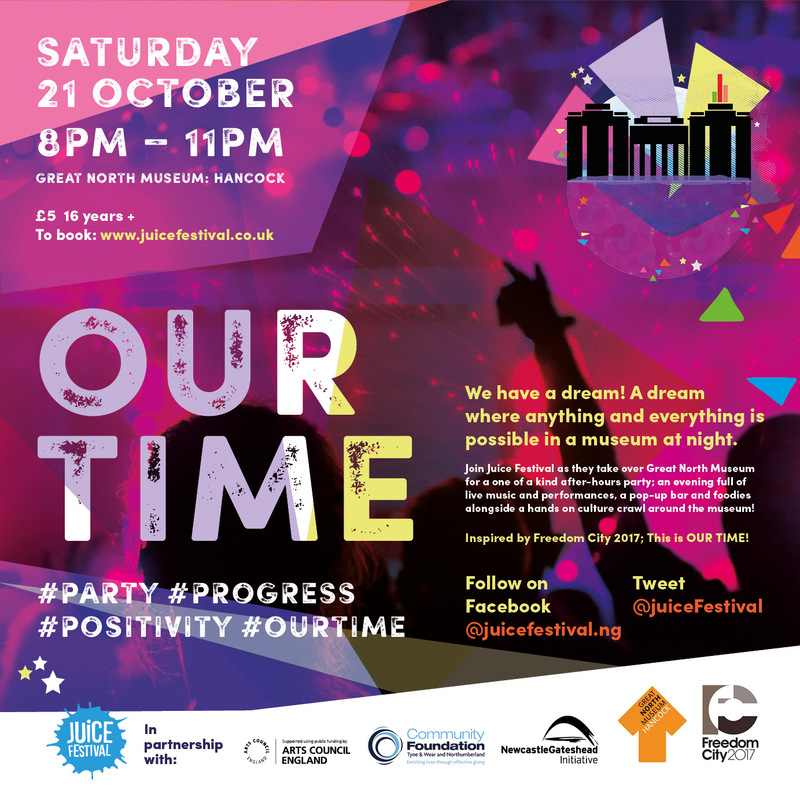 On Saturday 21st October (8pm to 11pm), I'll be attending the Our Time event hosted by Juice Festival at the Great North Museum, Newcastle upon Tyne. 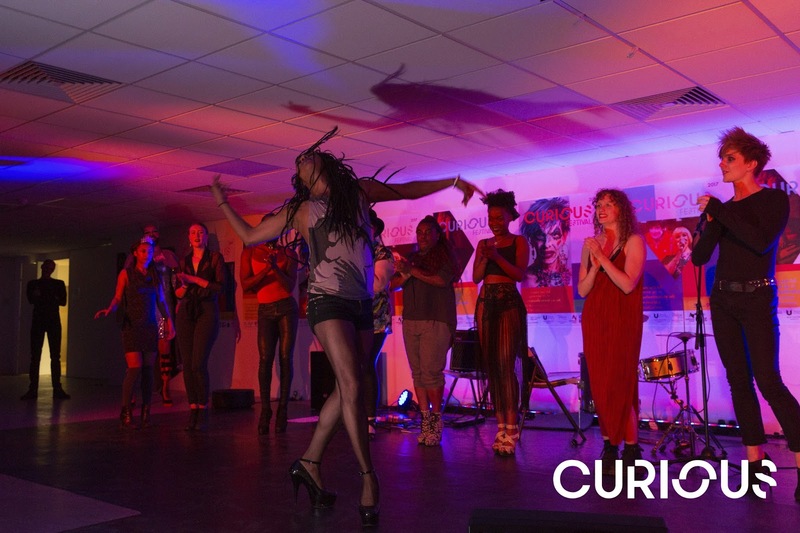 It's a fabulous event for over 16s, and it's only £5! It's a party by and for young people in the area and is inspired by Freedom City 2017. There will be live music, bar and food pop-ups, as well as some brilliant artists in the lineup. It's supposed to be immersive, fun and empowering and I can't wait to see what it's like. 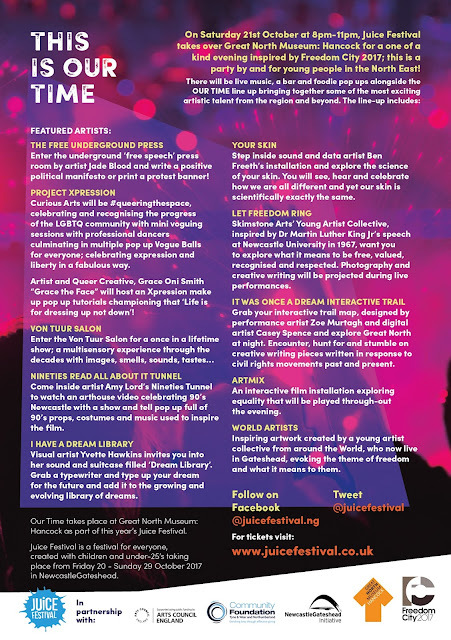 It's amazing to see a fun event for young people including things like free speech, LGBTQ celebration, equality and history. But in the form of a fun, and inspiring festival. For £5 this most definitely looks like it would be a pretty cool night out with your friends so grab your tickets HERE and hopefully I might see you on the night! If you do spot me, please come say hello! Last year I went for a bloodthirsty vampire for our usual Halloween get together with our friends. 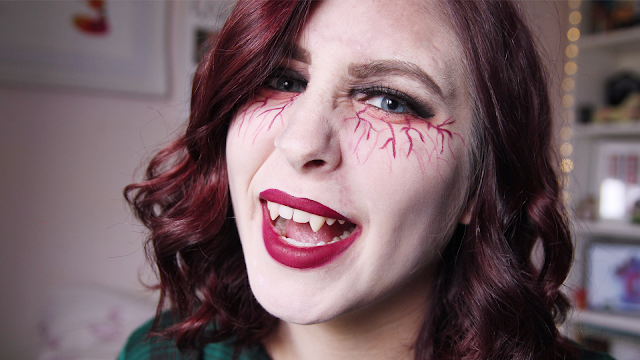 Since I didn't have a blog back then, I thought why not recreate this look for my blog this year since Halloween is just around the corner! 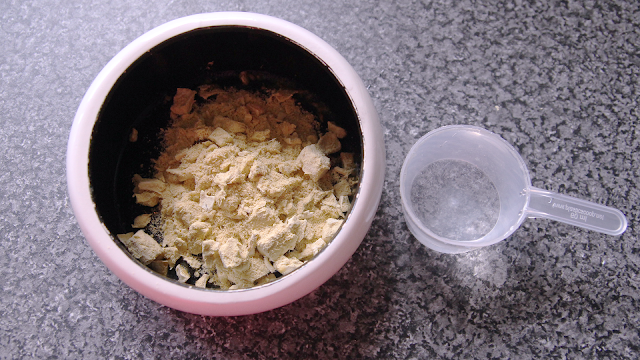 For my base makeup, I took a regular foundation in my shade. In this case, I used the Revlon Colorstay, but I added a little white face paint from Snazaroo, just to give a slightly paler effect without being bright white. 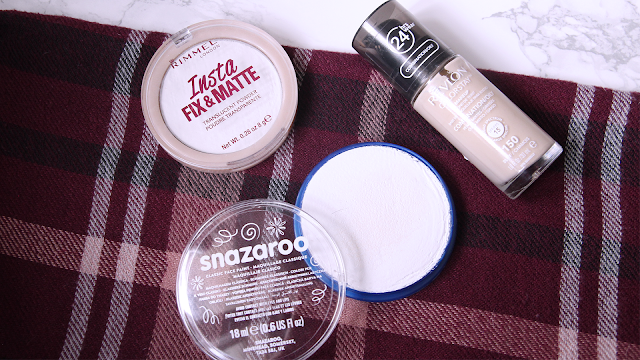 I set my makeup with a translucent powder like the Rimmel Insta Fix & Matte. I used two different palettes for this look. 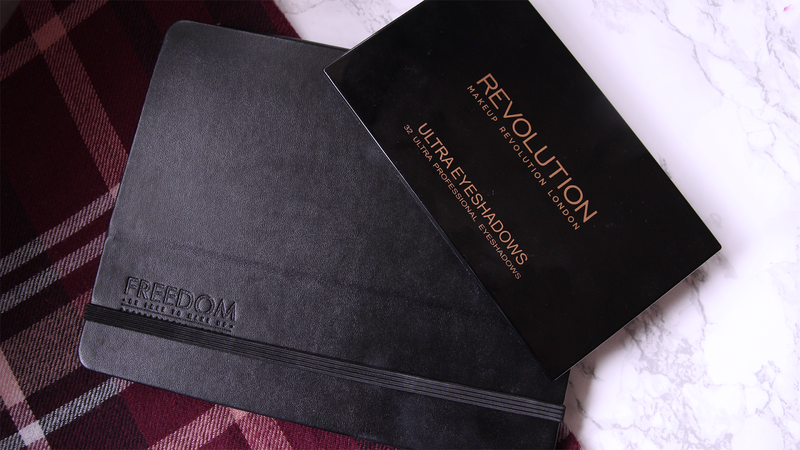 My favourite Makeup Revolution Flawless 2 and the Freedom Pro Artist Pad. 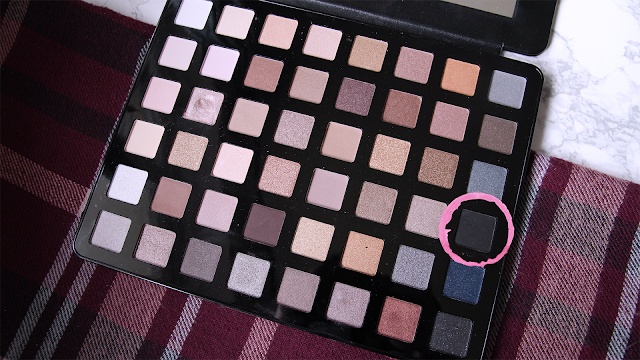 For my eyes, I used Impeccable, the burnt orange, as a transition shade and blended it across my crease. I also used this shade under my eyes, but blended it much lower than normal to appear like my eyes are dull and tired. I then took the shade Sound, the red, and also blended that in my crease to create a deeper look. I applied Unbroken, shimmer black, across my lid with a damp brush and packed it on without worrying too much about blending because I wanted it to look messy. I used Shine, the champagne, on my inner corner, just to make the look a little more put together. I used the black matte shade in my Freedom palette to contour the hollows of my cheeks, my nose, forehead and under my chin. This helps with appearing gaunt. 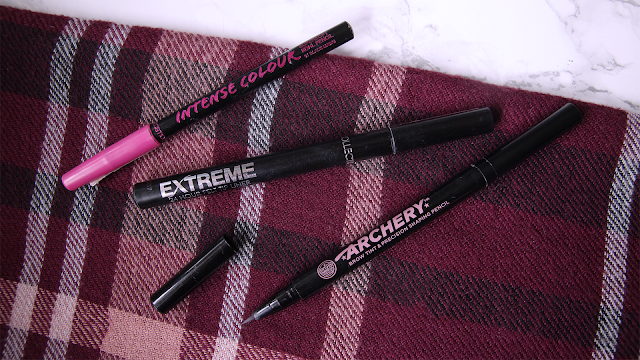 I lined my waterline with my Collection Intense Colour pencil liner and used the Collection Extreme Felt Tip Liner to create quite an exaggerated winged eyeliner. I wanted a more defined, darker brow than usual so I used the felt tip end of the Soap & Glory Archery Brow Tint and Precision pencil. Of course, I had to go for big voluminous lashes. I wouldn't usually get away with these but at Halloween they're always acceptable! I used the Kiss Lash Couture in Midnight. They're absolutely stunning. Now for the fun part! The bloodthirsty veins. You can go down the face paint route. BUT you can grab some lip pencils in different shades for much cheaper, and you can get a much more detailed application. I'm using two Collection Lip Liners. As long as you have a deep red, and a light red, it works perfectly. 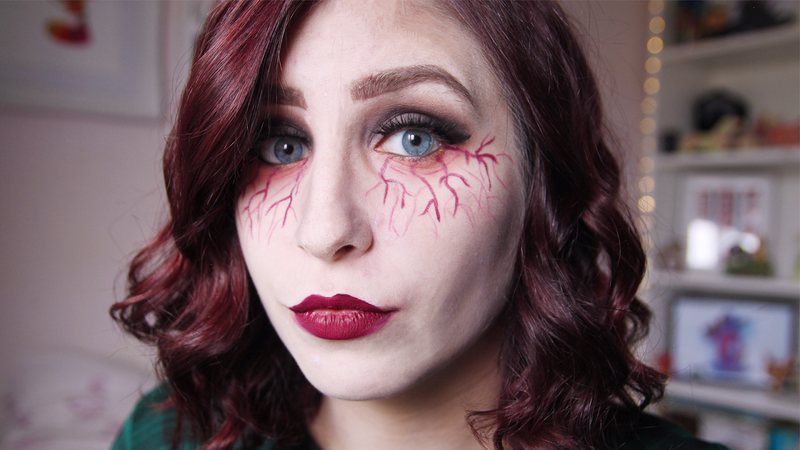 I used the deep red to create the more prominent veins, you can do this any old way. 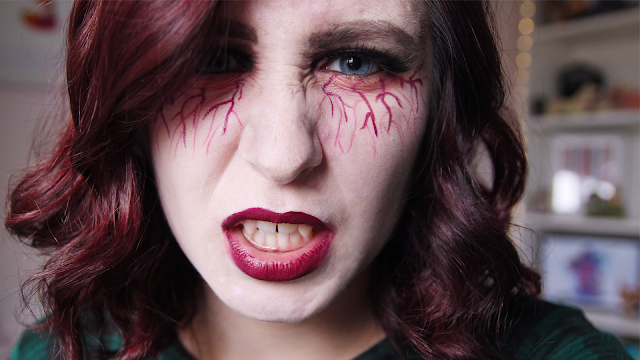 I then used the light shade to make capillaries, between the dark ones. 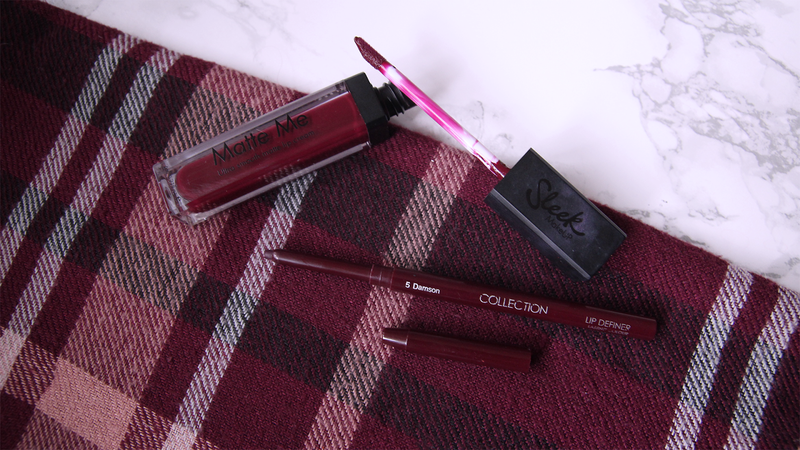 For my lips I went for a classic Halloween blood shade, with the Sleek Matte Me in Vino Tinto. 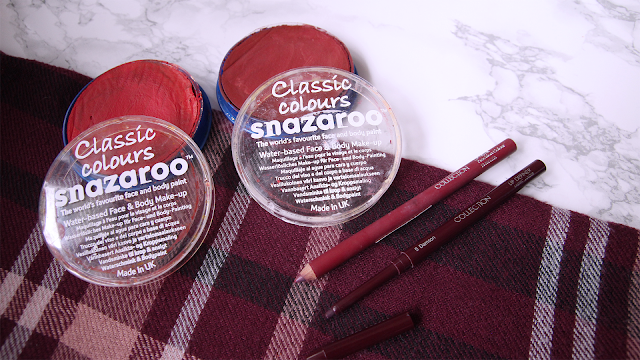 It's matte so you can enjoy your night eating and drinking without worrying about smudging. Now my favourite part of the look. 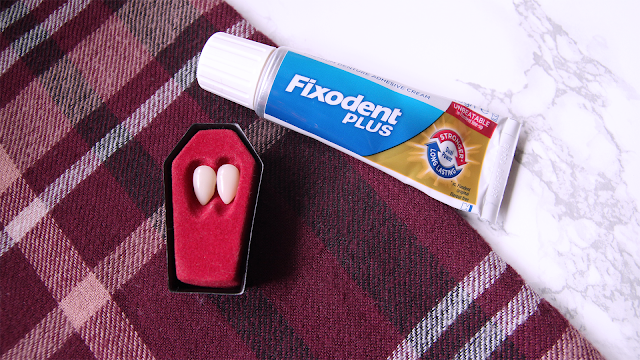 I bought these fake vampire teeth on Amazon very cheap. I found the "putty" that it comes with didn't work too great. After doing a quick Google for tips, I tried Fixodent! It worked amazingly. You do get a bit of a lisp for the rest of the night, but you can easily talk, eat and drink with these teeth in, and the Fixodent meant they lasted all night and didn't fall out once. Hope you enjoyed this quick and easy look! It's perfect if you're on a budget, or if you're not sure what you want to be this Halloween. If it gets too late, you can pull this look out of the bag wiith makeup you likely already own! I'm super excited to be writing this post, not only because the topic of the event was Women in Power and this makes me proud to be a woman in 2017; but also because this was my first proper event where I got to meet like-minded bloggers in the North East. I had the most amazing time, and I wanted to document the night as a whole on my blog! So, first of all, thank you to the amazing team at intu Metrocentre for inviting me along, I had a blast! 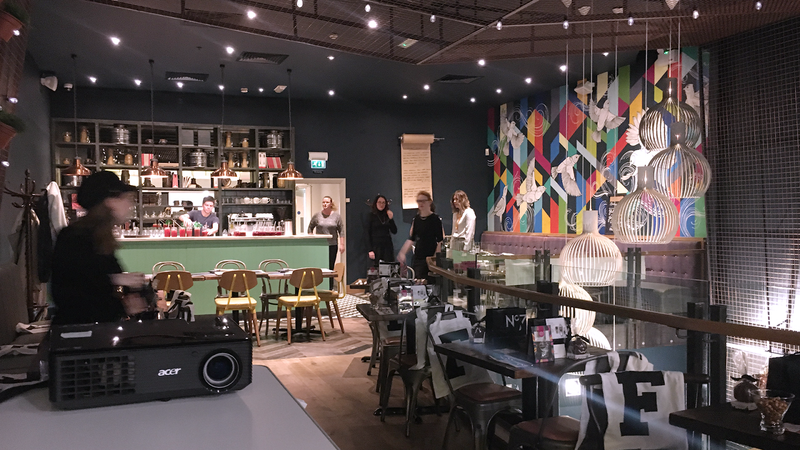 And thank you to Zizzi for the stunning location, which made for some super pretty photography backgrounds! Now I did carelessly forget to take my Canon, but I made do with my iPhone, so if the quality isn't great... sorry! Let's start off with my outfit since it was a fashion event. 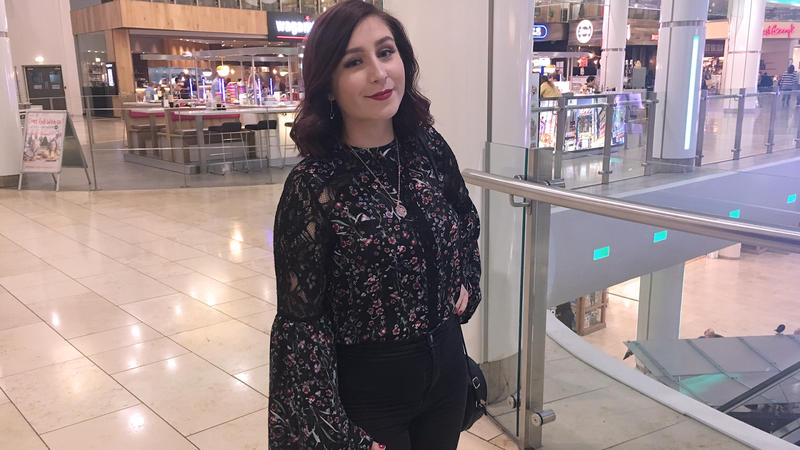 Anyone who knows me, knows I'm a cheap-as-chips budget girl, and can you believe this whole outfit was from the one and only Primark (in the Metrocentre too). Everything on my face was from the drugstore. I felt so confident in this outfit. I loved the lace cut-outs on the blouse and the large flared sleeves. It felt powerful and feminine to wear, very fitting for the topic of the night. 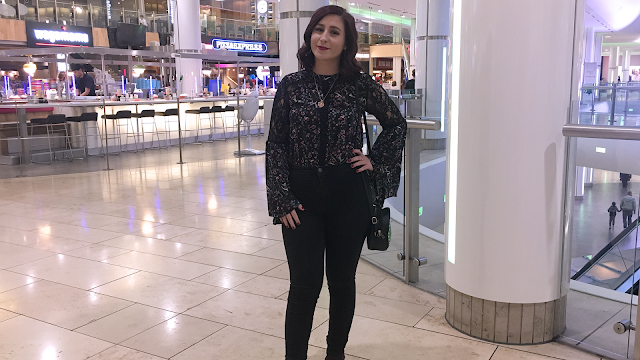 I paired it with some simple black high-waisted skinny jeans and my red faux-suede ankle boots. I was greeted by some amazing bloggers. Everyone was extremely friendly and welcoming, with it being my first time meeting them. I couldn't have asked for a better bunch of ladies to spend the evening with. 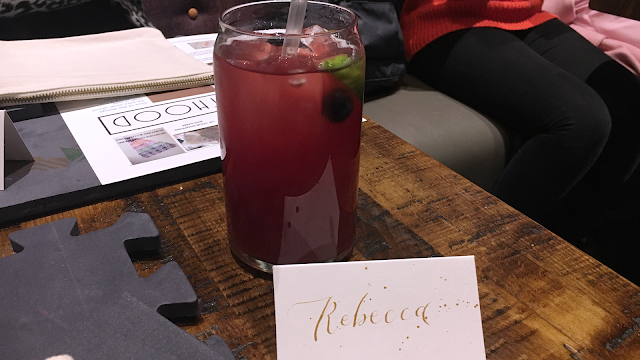 We were given our hand-written Calligraphy name tags, a mocktail and shown to the crafting area hosted by The Crafthood. 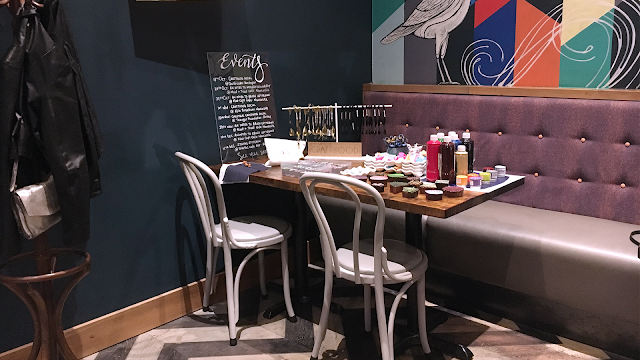 We were introduced to the art of stamping on fabrics and created our own cute little rustic makeup bags. 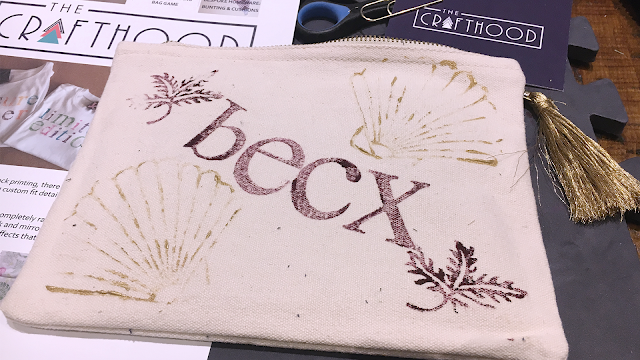 Of course, I had to put my blog name on my bag, as a memory that this was my first proper blogger's event, it's such a meaningful thing to hand make and then get to keep! 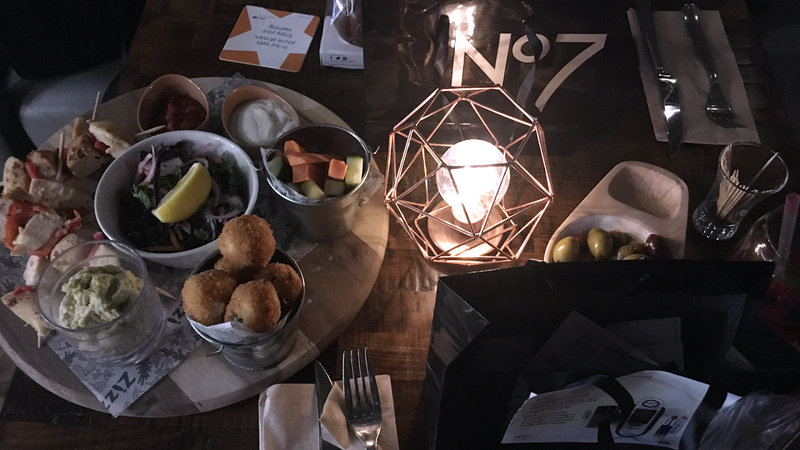 We were indulged with snacks and pizza from Zizzi. I've never actually eaten there before, but their pizza and garlic bread was freaking amazing. FYI, I'll be returning with Eric for sure to try out more foods. Italian is one of my favourite kinds of food, so that was a massive plus for me. There were cute goody bags for us on the tables which contain some lovely samples including things from The Body Shop, Estee Lauder, Benefit, No7, Nina Ricci, and yes, that adorable "Yumpkin" from Hotel Chocolat. 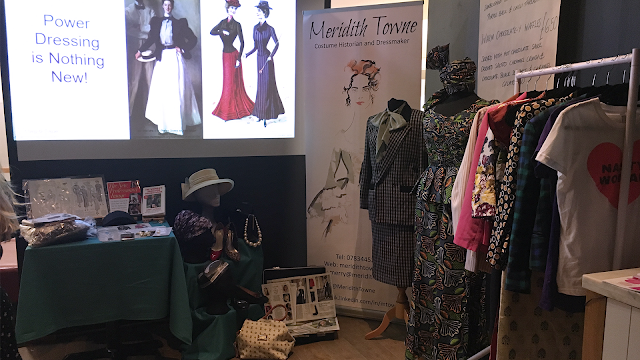 The main attraction of the night was a brilliant talk from Meridith Towne; a fashion historian and costume designer. It was one of the most interesting talks I've ever been to, discussing the importance of power dressing and how it's impacted Women in Power not only over the last 20 or so years, but throughtout history; as well as across different cultures around the world. 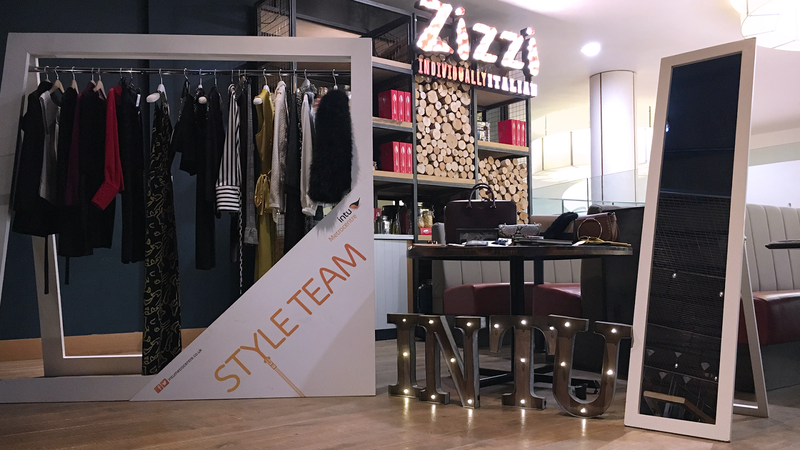 We looked into how symbolic clothing can be, from overall style, fabrics and patterns, right down to shoes and accessories. 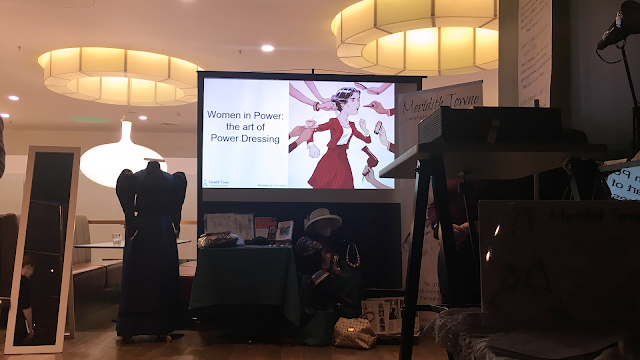 She showed us some vintage pieces she's collected, and it was really intriguing to see how important fashion has been for women over the centuries and how it's impacted the things we wear today. It was empowering to see how women have really come along as powerful leaders, CEOs, and influencers in recent years. Hopefully, this will continue over the next 10, 20 or 50 years. I would definitely recommend attending one of Meridith's events because she was brilliant. You can find where she is on History Wardrobe Events. 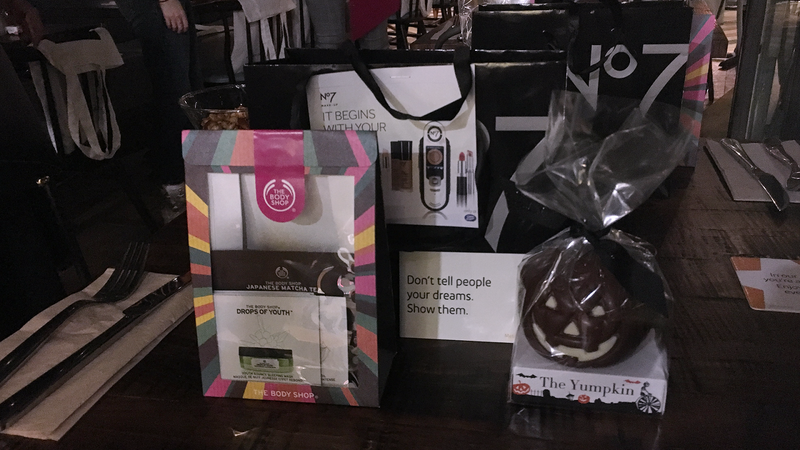 But overall, this was the perfect first event to attend, meet other bloggers, and I thoroughly enjoyed it. Thanks to the whole team that organised it, and for inviting me. I'm feeling so inspired to do more fashion posts now!